So an article was recently posted about how Doctor Who needs to let go of its past. I couldn't disagree more. I mean no offense to James Whitbrook, the author of said article. But Doctor Who has always been about time and history, and those that don't learn from their history are doomed to repeat it. Doctor Who has always been about a Time Lord (crotchety and not so crotchety) traveling through time and space, averting disasters. It's his Modus Operandi. The show has lasted as long as it has, because it has recycled— again and again— giving us a character that adapts and somehow represents his moment in the Zeitgeist, being present. Being 'now'. Right now, we have an extremely cross Peter Capaldi in the role, and he's done an admirable job. He's faced Daleks, the Sheriff of Nottingham, and quite possibly the most fearsome of all foes, his own imagination. Bringing old enemies back into the present fold binds the present show to its past. Yes, there's ample room for new villains: the Weeping Angels, House, the Boneless, etc. But part of the Doctor's appeal is how this new Doctor can fend off against classic villains. The Great Intelligence. The Daleks. The Master. It reinforces the series' greatest strength: continuity. I cannot express in words the dread and excitement I felt watching Utopia, the 10th Doctor's introduction to the Master. (Fun bit of trivia, the Master was first created to give the Doctor someone just as clever to face off with, whose name was also a hard-to-earn degree. He was the Moriarty to the Doctor's Sherlock Holmes.) Granted, I, like countless fans, pounced on Missy's name and derived that she was a new incarnation of the Master. 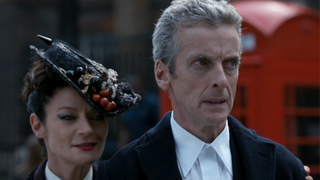 I hoped she wasn't… until I saw Michelle Gomez really shine in the most recent episode. I was afraid she'd turn the role into a pale reflection of the previous actors in the role, and she's exceeded my expectations. As the Mistress, she's allied herself with some of the Doctor's oldest enemies. That's entirely fitting in her MO. I'll be blunt: watching the Doctor pit himself against fresh, new enemies, doesn't sink home quite like watching him have to find new solutions to face age-old nemeses. It's not just improvisation. It's… history. It's personal. He recognizes the threat they present from the past, and is forced to come up with something new, in the present. It's fantastic. So yes. I say, keep bringing on the enemies of old! There's a reason the 50th anniversary featured the Zygons. It wasn't just enough to pit the 10th, 11th, and War Doctors against an enemy. It had to be an enemy that resonated with our nostalgia. Nostalgia is one of the great lures of the show. It always has been. I fully encourage new, creative enemies to be added to the mix of Doctor Who. But under no circumstances should it be seen as a desire to shuffle out the old. The Doctor is old. Impossibly old. He deserves to face enemies he's seen before. How else would he get that look of horrific recognition? Bring it on. The Doctor goes on, in perpetuity. Why shouldn't his foes?